Anyone who has worked in retail during the holiday season and heard the endless loop of carols played ad nauseum on the P.A. system usually sours on the idea of hearing even one more Christmas song. But this CD — a remaster of an old vinyl album that we personally had scoured record stores for years trying to find — will arouse enthusiasm even amongst the biggest Grinch! The music doesn't sound dated, and is suited to accompany a quiet dinner or a big, festive party. Regardless of how many Christmas albums you own, this one promises to offer a new polish on some old chestnuts. 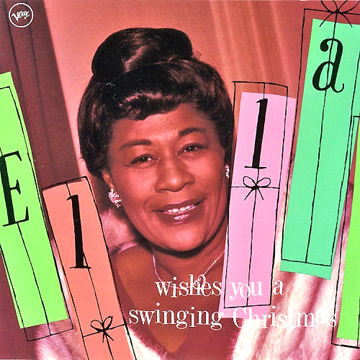 As the title implies, "Ella Wishes You A Swinging Christmas," has a jazzy feel. Her voice is strong, vibrant and full of energy. Every note she sings is flawless. The Big Band sound of Frank Duval supports the lyrics and joins her in the trip. The first two numbers, “Jingle Bells” and “Santa Claus Is Coming To Town,” set the tone for an upbeat and fun mood. When one hears “Sleigh Ride,” we defy anyone to still be a Scrooge. When Ella sings, “Hang your head down Rudy,” in “Rudolph the Red-Nosed Reindeer,” we get tingles. “Have Yourself A Merry Little Christmas” is rendered as a hopeful song of expectation, rather than the sad, “missing you” way that it is most frequently interpreted. On “Winter Wonderland,” Ella swings beautifully. It’s one of our favorites on the set. “White Christmas” and ‘The Christmas Song” are sung in an understated, but very effective and enjoyable manner. When you hear “Let It Snow, Let It Snow, Let It Snow,” you will feel good about the white stuff coming down outside, even if it does clog the roads and make you homebound! Just listen to those sax refrains on this track! It might surprise you to know that our favorite track is “What Are You Doing New Year’s Eve?” Though we think it should have been sequenced differently and put at the end of the CD, it captures the longing wistfulness of someone who is in love and hopes to welcome the new year in with that person. The genius behind this album and “The First Lady of Song” is all the more remarkable when we let you in on a little secret: Ella Fitzgerald recorded it with the DeVol orchestra in New York City on July 15 and 16, and August 5, 1960. But in the midst of the summer heat, they somehow got into the Christmas spirit and did an exquisite job of capturing the wintry atmosphere of the December holidays. There’s no doubt about it: This Ella Fitzgerald CD belongs in any collection of Christmas music. It is A+.